I first met Dalis when we did a quick maternity session before her little guy made his appearance. I think it was just a few days later that I got the "he's here!" text from an excited dad. A week later, Seeley was the best baby during his newborn session. 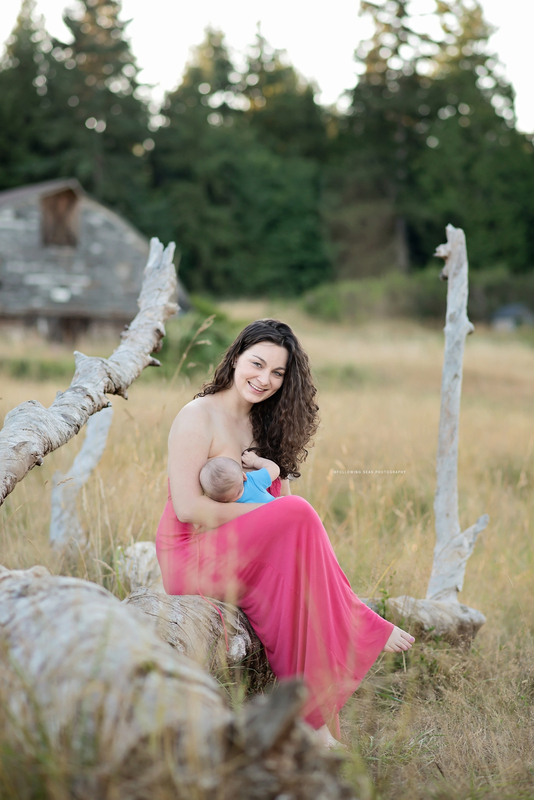 We got back together to celebrate World Breastfeeding Week with a special nursing session at Howe Farm in Port Orchard. About half way through editing her session, I sent Dalis an email saying "you should always nurse sitting on a tree in the middle of a field." I mean, seriously, how gorgeous is she? Between gushing over these images, you should also read the great things Dalis has to say about motherhood. "My first few nights of breastfeeding were spent in a hospital NICU. There isn't the sense of comfort you get from being in your own home. There's no dim lights or soft music, just the hum of machines and beeping of monitors. By the time I got home with my son, I was completely confident in my ability to breastfeed." "Don't give up! It's difficult, frustrating and sometimes painful, but I promise it gets better and easier. Do your research and take advantage of the tools provided, like a lactation consultant. Even if you know what you're doing, having a professional give you reassurance is confident boosting." "My favorite part about being a mom is knowing that no matter what, my son will love me. Even when I feel like I'm failing or messing up, I look at my son and see this smiley happy baby who thinks I am the world. He has opened my heart and mind to what is important in life." "I hope that he will follow his dreams and won't let anyone hold him back, including me. I hope that he will be compassionate and caring towards others, young and old, and set a good example for others."